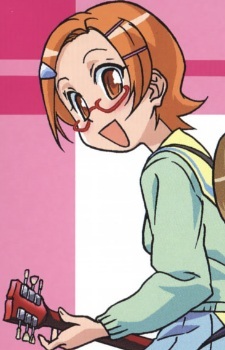 Miyako is known as "Study-Bug", a name which she earned through her perpetual studying and which she detests, though her score is almost average. She will often get mad if she is unable to study due to the crazy antics that she often gets put into, which are also often against her will. Miyako was even handcuffed to Sayaka Suzuki in episode 16 to get her to track down Ichijou. She has a bizarre trait which caused others to create yet another nickname for her, Deko, which stands for "convex surface", because she has a very large and very shiny forehead which gets more extreme with each episode, It starts off with a simple sheen in the first episode; in the second episode, it becomes a blinding flash; by the third episode, others are actually able to style their hair in the reflection on her forehead. In a later episode, her forehead becomes so bright that the other characters are forced to don welding masks to be able to look at her. Also, she apparently possesses ESP. In some of the more strenuous events in the series, she always tries to keep a level head, though is not always able to accomplish this with sheer will power alone. She is not always seen wearing glasses as she does have contact lenses as well. She explained in episode 4 of the anime that after long hours of studying, it's much easier on her eyes to wear glasses than contacts.